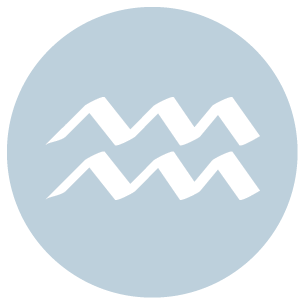 The Moon is in Taurus until 12:15 PM. The Moon is void until 12:15 PM (since yesterday at 8:25 PM). 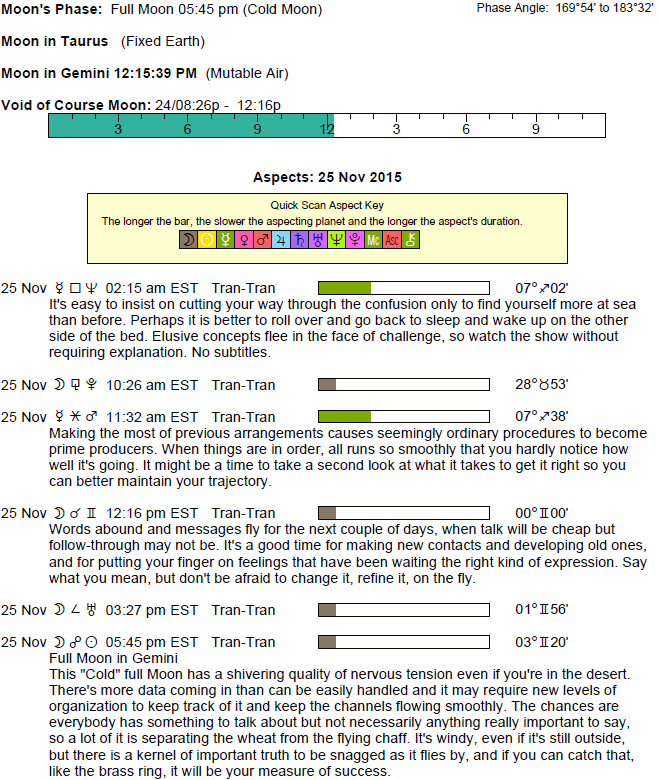 The Moon is in Gemini from 12:15 PM forward (until Friday, November 27th, at 2:26 PM). The Moon is waxing and in its Waxing Gibbous phase until 5:44 PM / the Moon is waning and in its Full Moon phase from 5:44 PM forward. A Full Moon occurs today at 5:44 PM, in the sign of Gemini. 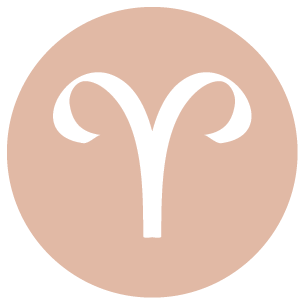 A Full Moon occurs today in your communications sector, bringing a project to a head or an important realization into your consciousness, dear Aries. You also have good energy with you today for motivation to pursue a learning endeavor or further a mental interest. Conversations with a partner or special friend can be super helpful, encouraging, and motivating. You are attracting strong, competent, and loyal friends to you now. This is a time for putting ideas into action, sharing thoughts and beliefs, and strengthening alliances through communication. Tend to important errands and demands that are likely to arise today so that you can free yourself up for more adventurous and fulfilling activities. Do what you can to avoid a feeling of being overwhelmed today and this week – it won’t help anything! 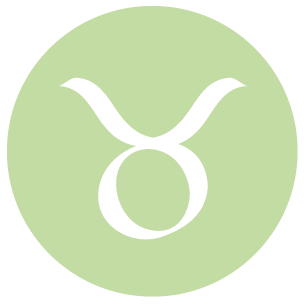 This can be a strong day for supporting others through practical help, or for receiving this kind of help, dear Taurus. It’s also a strong time for work and research, as you can feel more motivated than usual. You might become more aware of the need to take charge of health and fitness matters. A Full Moon occurs in your money and values sector, and this can bring a financial matter to light, a business project to fruition, or it can point to a revelation about how you are valued and respected by others. If you’ve been overspending, this is a reminder to tighten the reins. It’s a great time to give it your all when it comes to pulling in income or developing a talent. There can be a settlement of money or attention to something that you owe now, but emotions today can just as well have to do with an intimate matter. This morning is good for tackling difficult problems or taking on a mental challenge, dear Gemini. You are very willing to act on your ideas, and although you’re self-motivated now, a partner or special someone can be encouraging as well. A Full Moon occurs later today, and is in your sign, stimulating epiphanies and realizations as well as heightened emotions. You might realize your feelings about someone or something in a rush. This can give you a nice boost forward. You may not want to act on personal revelations just yet simply because feelings are a little raw, but you certainly can gain from the clarity and begin considering ways to make important changes that take into account any personal revelations you have now. 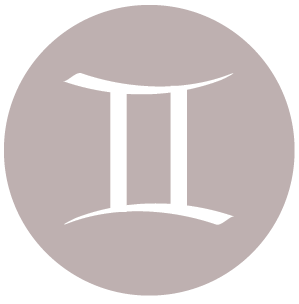 You could feel quite driven to put an idea into action or to pursue a line of thought today, dear Cancer, especially if it’s related to family, home, health, and work. This can be a time of organizing or reorganizing, when it’s easier to get through things quickly and efficiently. Illuminating conversations can be had at your workplace or through people you deal with on a daily basis. This afternoon’s Full Moon occurs in your privacy sector. This can bring a secret or private matter into awareness, a work project to fruition, or a health matter to light. It’s a time to become more aware of some of your deeper, buried feelings. Previous hurts can come to light now, and this of course makes them easier to heal, but you might initially feel flooded. You might also experience a sudden, strong desire to sort things out on your own. Some desire to withdraw is likely today. 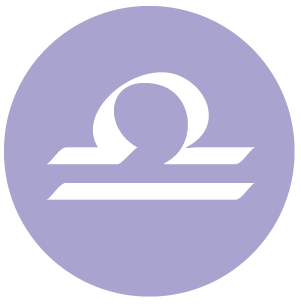 You are able to put a creative spin on whatever you’re doing this morning, dear Leo, and decisions tend to be quick but practical as well. It’s a great time to take care of business or get clarity on a matter. The Full Moon this afternoon can illuminate a friendship or romantic matter for you. It shines brightly in your social sector, and this can prompt the need to come to a friend’s aid, an invitation, or the discovery of important information that completes your picture of a social matter. A romantic revelation is possible, or an announcement can be made by a friend, lover, or child. There is good energy for you to work on a plan for a new long-term goal, but the details will need to be ironed out at a later date when your head is clearer. This can be a good day for picking up new information – ignore the gossip, and do a little research and digging when it comes to more factual topics. Love relationships can be complicated to figure out now. 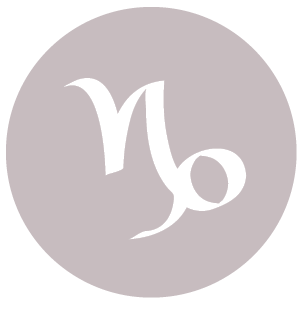 Energy levels are good today, dear Virgo, and you are assertive in a healthy way, willing to take the lead in order to get things done, but also conscious of others’ input and needs. It’s a good time for solving problems at home or with business. Hopeful and optimistic feelings revolving around work matters and living conditions. This is a good time to work on a budget or to talk about finances and strategies. 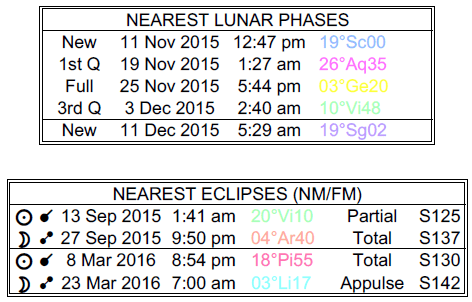 A Full Moon occurs in your public and career sector later today. This increases your visibility in general, and it can bring up questions about your responsibilities – what you’ve done in the past, and what you plan on doing in the future to fulfill obligations. You can be a leader now, and circumstances may be such that you are pushed into that position. It’s important to be as professional in your demeanor as possible, even if your “buttons” are being pushed now. While personal matters have demanded a lot of attention lately, there is a nudge towards work and responsibility now. 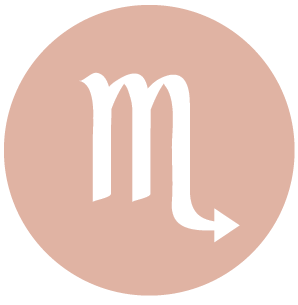 This is a good day for personal magnetism and influence, dear Libra. It may be something you say or do that magnetizes opportunities to you. It’s a good day for making a proposal or presenting an idea. You can more successfully put an idea into action today. Later today, it can be challenging for you to concentrate on the more mundane or regular affairs of everyday life with a Full Moon occurring in your adventure sector. There can be a strong urge to take off somewhere, or to go down a new path on a mental level. For some, this is a time of an important announcement, publishing, or promotion. An idea that you’ve been working on might blossom now. There can be some frustration with chaotic schedules or disarray in your daily affairs. Try to get things into order as much as possible in order to free yourself up for opportunities. 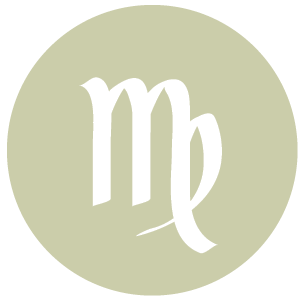 This morning is strong for healing activities, dear Scorpio, as you are drawn to activities that are regenerative in nature. It’s a good time for gaining new information through study and observation. You can more easily focus your mind and prioritize. You are ready to take on intellectual challenges and your problem-solving skills are above par. Tricky issues or ideas can be tackled now with greater ease. Communications with others are energetic and forward-looking. A Full Moon occurs this afternoon, stimulating the sector of your solar chart that rules finances and/or shared resources. Intimate matters may be in focus. There could be some drama with regards to money, or it might be a time for settling debts or collecting on money owed. Take your time when it comes to making any super-important decisions in your intimate life. Emotions are strong right now, and they’re at battle with logic. A wait-and-see attitude can come in handy right now. It’s especially straightforward to make a friend or to enjoy a current friendship today, dear Sagittarius. Express yourself and stay flexible – be spontaneous if you feel right about something in your heart. This can be a time for lending someone a hand or acting upon an idea with much satisfaction. Later today, a Full Moon occurs in in your opposing sign and solar partnership sector. Previously undiscovered emotions or relationship issues can come to light. There could be a culmination of a personal project for some. This can simply be something that has been brewing inside of you that now reaches a personal epiphany. This energy can be very revealing on an inner level. Sudden awareness of a pre-existing situation, or totally new information, can figure strongly today, especially regarding a significant other in your life. Work on emotional self-control today, but do listen to what your feelings are telling you. 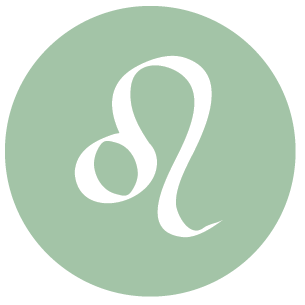 You can feel considerably more optimistic and ready for action today, dear Capricorn. You are motivated to fulfill your duties, and then some, and the positive feedback only serves to encourage you further. You may effectively read between the lines, draw upon past experience, or uncover information now that helps you advance. As quickly as the day may demand your attention, taking time to center yourself will be appropriate. A Full Moon occurs late afternoon, reminding you of the need to better manage your daily routines, work, and health. Deadlines can be pressing now. No need to jump to conclusions now, however, because the emotional energy level is too high to see clearly just for the time being. Even so, it’s important to acknowledge the feelings that emerge today and make a plan for better meeting your needs going forward. You are expressing yourself with confidence and verve today, dear Aquarius. You can be a little more assertive than usual in effective rather than assertive ways. Grab any opportunity that arises now that pulls you out of your usual routine and adds a dash of adventure to your life. Problem solving or active involvement with a friend or group can figure strongly. 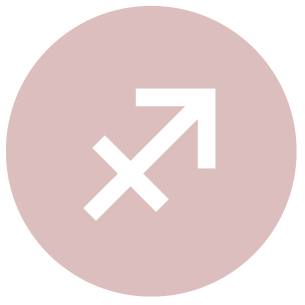 A Full Moon occurs in your creativity and romance sector late afternoon, and it’s bringing illumination to an issues surrounding friends, romance, and personal goals. There can be an epiphany, a significant turning point, or final word on a matter. Listen to your heart, as you’re likely to discover your feelings about someone or about a pet project. 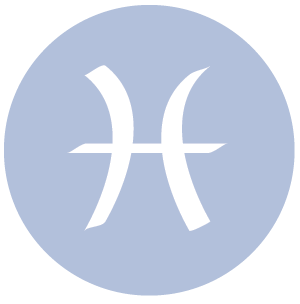 You have the stamina and energy to accomplish a lot in the first half of the day, dear Pisces, although later with the Full Moon, emotions can be a little draining. There is a focus on treating one another fairly, and on straightforward communication. Your x-ray vision is strong this morning, which is good for business moves or strategies for general life direction and next steps. It’s rather easy to drum up support for what you’re doing and saying. The Full Moon later today can stimulate a sudden need to shuffle around your priorities, as your attention turns to your home front and inner, personal plans. Emotions surface and light is brought to feelings and situations that were previously hidden. The need to strike a balance between your career and family life (or your professional and personal life) becomes evident with the events of the day and this week. These areas of life are stirred up for good reason, and this reason is likely to be clear in the coming weeks. 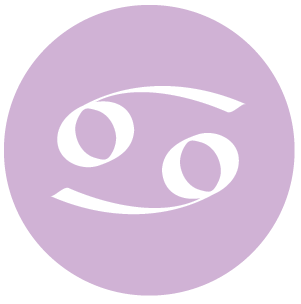 If Your Birthday is November 25th, If Today is Your Birthday full horoscope here. Sabian Symbol: A jewish rabbi. 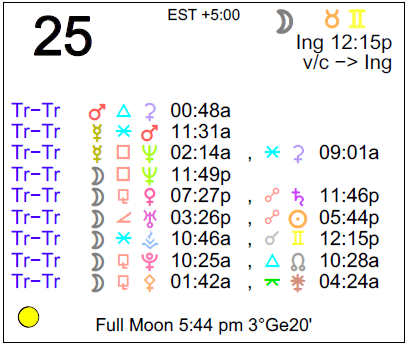 Sun 00° Taurus 05' 49"
Moon 13° Scorpio 26' 23"
Mercury 04° Aries 06' 20"
Venus 29° Pisces 45' 16"
Mars 13° Gemini 18' 36"